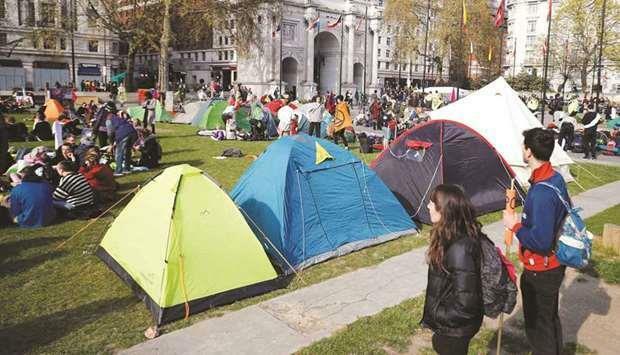 (MENAFN - Gulf Times) Climate change protesters brought a bridge in London to a standstill and choked off central streets at the start of a civil disobedience campaign that also saw action in other parts of Europe. The so-called 'Extinction Rebellion is being organised to attract attention to the slow response of governments around the world to rising temperatures and sea levels caused by greenhouse gas emissions. More than a thousand people blocked off central London's Waterloo Bridge and potted plants along its length as yesterday's largely peaceful events kicked off. 'I'm here because our generation is going to be affected by this, said 22-year-old Ruby Brookman. 'Our generation is getting more open, there is a vibe, she said. 'Shell knows!, said one sign spray painted on the building. 'Crime scene, said another. Police officers detained suspects at the building while demonstrators held up a banner reading 'fossil fuels are killing us. 'The plan is disruption and that disruption escalates until you get the attention of the people you are persuading to change, movement spokesman Larch Maxey said. A couple of dozen people also blocked one of the entrances of the entrance of Spain's Repsol energy company in Madrid with a sign reading: 'THERE IS NO PLANet B. But the most colourful — and disruptive — protests saw people set up vegetarian food stalls and roll out wheelbarrows to renowned London street intersections such as Piccadilly and Oxford Circus. Oliver Paines was part of a group of people who protested in the public gallery of parliament's House of Commons on April 1. 'We are farmers. Twenty years ago we saw the way farming was industrialised, destroying and damaging human life with pesticides, the 68-year-old Cornwall resident said. 'Every day, we see evidence of the planet in crisis. Fellow Cronwall native Sally Hole agreed. 'We've been ignoring scientist reports, the 34-year-old said. 'Our house is on fire, she said. 'Weather becomes more and more unpredictable, I believe that is going to continue. What do we do when we run out of food?